Juventus track riders selected to 2018 Commonwealth Games Team! 2018 Commonwealth Games selectee Stefan Ritter (Juventus) will compete in Sprint events. 2018 Commonwealth Games selectees include Kinley Gibson (Juventus), Allison Beveridge, Ariane Bonhomme, Annie Foreman-Mackey, and Steph Roorda. This selection to a major games is an exciting first for both of these young Juventus members. But it is not a surprise: Kinley and the pursuit team have been competing well on the world stage all season with 3 World Cup podiums, including winning gold at World Cup III in Milton. Stefan showed his return to form when he took silver in World Cup V in Minsk. His journey back to fitness and performance was subsequent to recovery from a summertime crash. And Juventus boasts another selection: NextGen rider Devaney Collier has been named as an alternate to the CG team. Devaney rode well at World Cup V, where her team won bronze in Team Pursuit, and she raced in the 4 event Omnium. Devaney Collier (Juventus) has been selected as alternate to the 2018 Commonwealth Games track team. The quad annual games will be held on the Gold Coast of Australia with the track events run in the new Anna Meares' Velodrome, located just outside Brisbane. 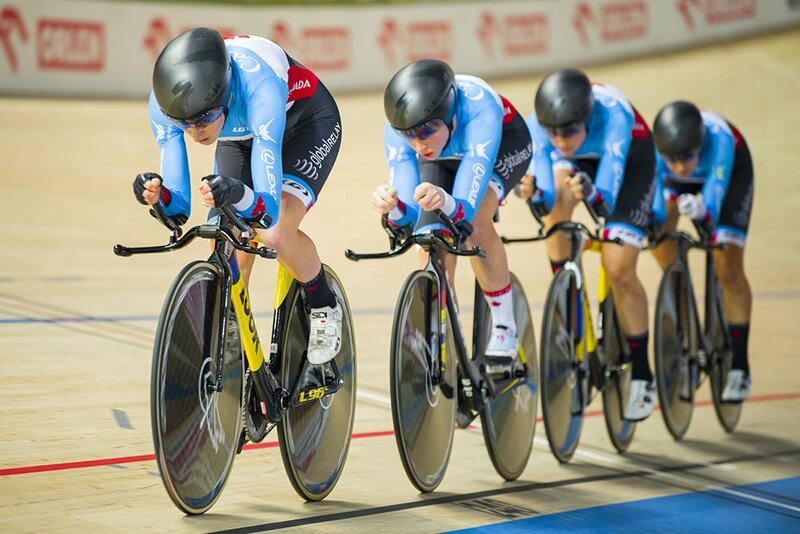 Stefan will be competing in the Sprint events, while Kinley is designated for the endurance side - Team Pursuit on the track, and the Road Race on the Gold Coast. Both Stefan and Kinley are currently preparing for the 2018 World Track Championships in Apeldoorn, Netherlands (February 28 - March 4th). Posted on January 24, 2018 by @Juventus Cycling .